It is my opinion that you cannot create a convincing character until you have made a broad study of human nature, just as you cannot speak a foreign language until you have studied it thoroughly. Not having reached an age at which I consider myself qualified to invent a character, I content myself with simply describing one. "The landmark novel that inspired Verdi’s opera La Traviata,in a sparkling new translation published to coincide with a major new biography of the real-life “Lady of the Camellias. One of the greatest love stories of all time and the inspiration for Verdi’s opera La Traviata and the Oscar-winning musical Moulin Rouge!, The Lady of the Camellias tells the story of Marguerite Gautier, the most beautiful, brazen, and expensive courtesan in all of Paris. Known to all as “the Lady of the Camellias” because she is never seen without her favorite flowers, she leads a glittering life of endless parties and aristocratic balls, with the richest men in France flocking to her boudoir to lay their fortunes at her feet. But despite having many lovers, she has never really loved—until she meets Armand Duval, young, handsome, and from a lower social class, and yet hopelessly in love with Marguerite." I recently saw Verdi's beautiful opera La Traviata (The Fallen Woman) for the second time, and I wanted to read the novel it was based on as well as the new biography (review tomorrow). Liel Schillinger's translation purports to be closer in tone to the original French, and I was excited for that. That said, the book was still kind of overwritten at points; however, it wasn't too bad in terms of the writing. It was also a very moving story, and despite its deeply tragic nature, there were flashes of humor in the book; humor at Marguerite's situation, and humor at the rich society ladies who flock to her apartment after she's dead to look at all her goods. When she was alive, they would have never even deigned to talk to her, but after death, her jewels and furniture proves too much to resist. Obviously, I haven't read the original text, but this translation seemed to be fairly true; it was open, honest, and didn't shrink away from describing Marguerite, the "most beautiful, brazen, and expensive courtesan in all Paris" or the wild parties that she threw and attended. The text wasn't totally modernized, but neither did it employ the flowery phrases that other translations have (I looked at a few of them online, and it was pretty awful). Liesl Schillinger has done an admirable job, I think, and I would recommend this particular edition. It has a lovely cover too. The only other really worthwhile one is, I think, probably the Oxford World Classics edition. 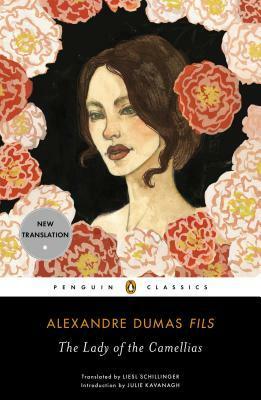 Alexandre Dumas-fils was the famous Alexandre Dumas's son, but his work, or at least The Lady of the Camellias differs greatly from The Three Musketeers. It is a deeply romantic and tragic story, though also somewhat cynical; in the beginning, there is great emphasis on those who flock to Maguerite's home after she is dead. It makes our narrator very angry. Dumas-fils is prone to moralizing and postulating a bit at the end of some chapters; I really didn't like that. It took away from the story and his ponderings were mostly uninteresting, although very typically Victorian. The story itself, however, was well told; towards the beginning of the book, I found one passage particularly moving. The narrator is talking with the caretaker of the cemetery Marguerite is buried in, and he says that he loves her most of all, more than the graves of the rich whose relatives never come (another condemning of the hypocritical wealthy, you'll notice). Then he adds, "People like me, sir, are forced to love the dead, because we're so busy that we hardly have time to love anything else." (pg. 33). It was a really moving chapter of the novel. The character of Armand Duval is of course based on Dumas-fils himself, and the actual narrator of The Lady of the Camellias serves to make observations and listen to Armand's tale. The narrator knew Marguerite only by sight, but he is a good man, and is very grieved to hear of her death, even more so when Armand eventually tells him the sad tale. This takes a while to get to, but the book isn't boring before then; there is talk of the auction to appease her creditors, the narrator meets Armand, there is the awful transfer of her coffin, and Armand briefly falls terribly ill of brain fever before miraculously recovering. His story begins on page 43, but it feels like longer than that in some ways. That's where the story truly begins; the rest is just a prologue, an introduction, although an entertaining one. Certainly, no part of the story is boring. I was surprised at how candid and frank the writing was; Dumas-fils doesn't shirk away from describing the life of a kept woman. There were many stirring descriptions and images in the book of the sadness hidden underneath the life that Marguerite lives, of how she has to leave the room coughing blood at one of her wild parties, of how no one visits her when she falls ill, but when she's well, everyone flocks to her. Armand is the only one who cares more deeply for her, coming to see her when she's well and when she's sick. The Lady of the Camellias is a beautiful novel, romantic and tragic. It should be better known in its own right, because it's a great story and well-written. I would highly recommend it. I received a copy of this book from Penguin.